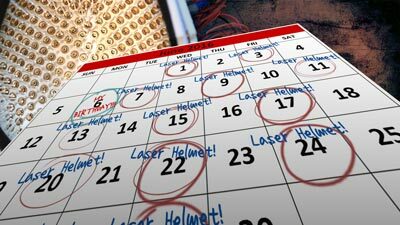 We're in the dead of summer now and I think most of the [lucky part] of the Northern Hemisphere is on vacation, but I'm still here making the world's greatest laser helmet for hair loss --The Laser Messiah II!!! 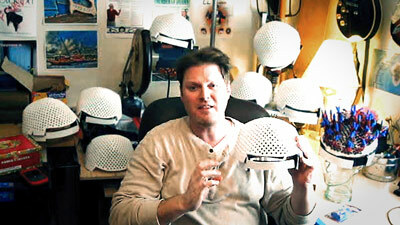 I've got a great new "gizmo" that I've been trying, and it's a SCALP HEATING CAP! This seems to be a great way to help those topicals like the polysorbate 80 / alcohol mix penetrate deeper into the scalp! I'm also experimenting with a new STRONG 50% Glycolic Acid Scalp peel! You can read about all this and more in my weekly note entry for this week!!! 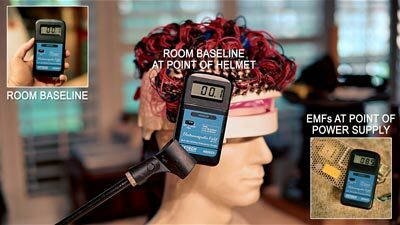 I added another GIZMO a couple of weeks ago, and I think I might be a "lifer" with this like the scalp massager. 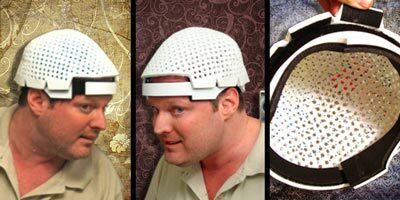 It's a SCALP HEATING CAP! 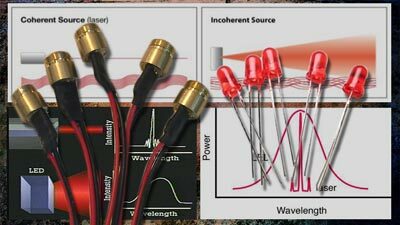 I learned this trick recently from RosarioRose9 -the guy that actually INVENTED the 50/50 polysorbate 80 / ethyl alcohol formula that is a KEY PART of my "Laser Usage Protocols. That is an interesting story, by the way (and it includes some proof that it works) and I'll talk about it soon in my video. I can't reveal personal information about someone, OBVIOUSLY, but what you need to know here is that RosarioRose9 makes VERY GOOD DECISIONS IN LIFE. If you ever see a post from him, please pay attention and read it twice! Oh, one more thing about the poly80 formula, I firmly believe that pretty much any hair loss sufferer would benefit from that formula, by the way. I'll save that for a future post, though! Anyway, back to the cap: Rosario uses his scalp heating cap after he puts on the polysorbate 80 / ethyl alcohol formula. The cap helps dilate the follicles, open the pores, and the heating of the THICK formula helps to thin it and helps it to penetrate more deeply -not to mention it helps draw at least a little bit of blood flow to the area. I've used mine for a couple of weeks now and I completely agree, and I'll be a "lifer" with it. 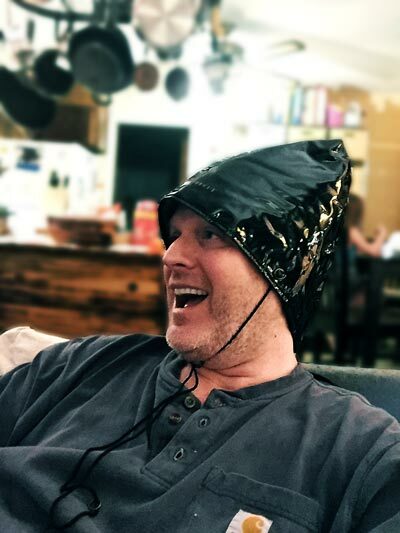 OverMachoGrande enjoying his scalp heating cap! Let me stress something here, too… I want to be a "lifer" with it because I ENJOY IT! It's therapeutic! It feels great using it, and I look forward to it --just like the Laser Messiah, the scalp massager, and the other things I do! So, when people see this sort of thing and get "overwhelmed" that you aren't going to have the time to do it, you're coming at the problem from the wrong angle, and you aren't taking into consideration that some of these things are very enjoyable and you'll WANT to do them! Apply the Polysorbate 80 / Alcohol mix with a dropper. Apply this carefully! It's really thick, and you should focus on the SCALP vs. the hair, and spread it around gently! 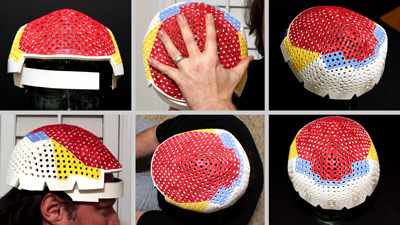 Use the scalp heating cap for 10-15 minutes or so! Take a shower with good shampoos, and really SCRUB HARD! Want to step up your game?? Use a shampoo scalp scrubber to really invigorate the scalp and get that stimulation going! Most of my customers already know the formula for the polysorbate 80 / ethyl alcohol mix, but I'll have more on that for the rest of the public very soon! 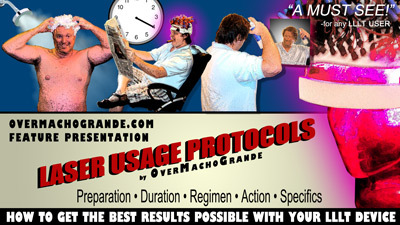 You can always email me at omg@​overmachogrande​.com, too -like I said, I think most everyone would benefit from this formula! 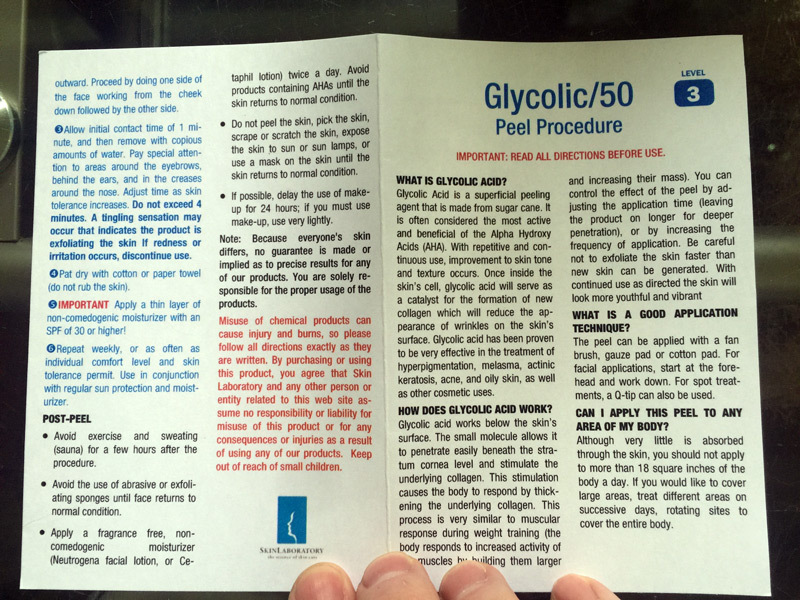 I recently bought a new type of scalp peel, and it's a 50% glycolic acid mixture! …and wouldn't you know it that this possibly ties into the aforementioned scalp heating caps! Convenient! Scalp peels are so hugely important that every single day, I kick myself for having those two life-threatening ailments over the past five years that kept me away from posting new articles. Seriously, just like with the polysorbate 80 / alcohol mix, this is something that EVERY BALDING PERSON should be doing. I've been giving instructions in my "Laser Usage Protocols" for years, but I realize that people really need to SEE THEM DONE to understand. 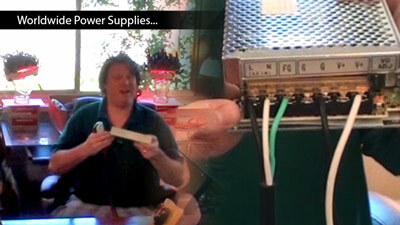 So, ha ha, those videos are coming soon! Basically, scalp peels are just facial peels. Facial peels have GREAT science and studies behind them, and they absolutely work to rejuvenate and remodel the skin of the face. HOWEVER, the face is vastly different than the scalp, and if you've done a scalp peel and had some drip down to your forehead, you already know this! Ha ha, in fact, it's really easy to determine where the "line" is between your scalp and your face due to the pain! 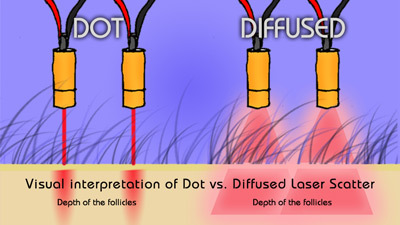 :) Anyway, the idea is that since the scalp is so full of fibrosis/calcification, and has less nerve sensitivity anyway, we use a little bit different method of application (that I spell out in my "Laser Usage Protocols"!). Just like with the polysorbate 80/alcohol mix, Scalp Peels are something that EVERY BALDING PERSON should be doing.This was brought to our attention in the forums by "Scalp Skin Lady" (Karen) in the forums. Karen previously had a clinic in which she administered scalp peels to customers, and she reported that repeated uses over the course of a year really showed results. Ok, pay attention to that part. SHE ACTUALLY HAD A CLINIC, AND HAD GREAT RESULTS WITH SCALP PEELS ON HER CUSTOMERS!!! …and I know that she's been gearing up to become active again with her business, and she might have kits available again that have the peel, the brushes, etc. I've previously used weaker glycolic acid mixtures, and they are pretty mild. Seriously, 20% can be used every other day (at least on my scalp!). That, however, isn't ideal for me… I'd rather being doing other things in that precious time slot. So, the idea here is that I want to do something STRONGER that really "wounds" the scalp, and then it can heal over the course of 1 week or so. 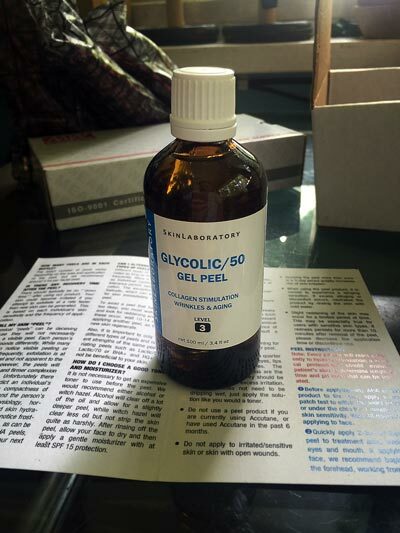 SKINLABORATORY's "Glycolic/50" 50% glycolic acid peel! I bought it on Amazon, and seriously, this bottle should last me a long, long, time (years?). Pages 4 and 1 -the outside covers! Pages 2 and 3 -the inside pages! 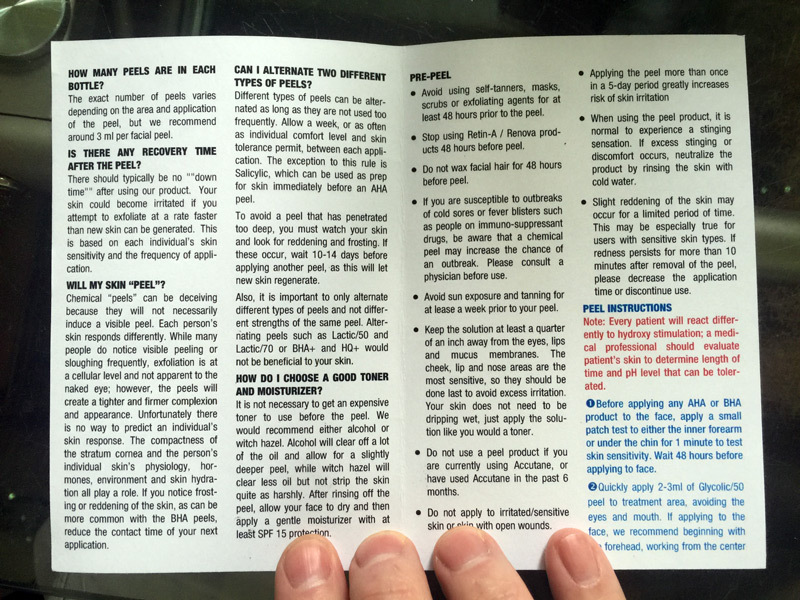 Sorry… I'm not going to scan the instructions and make them nice and pretty -life is too short for that! Scalp peels SHOULD NOT damage hair -but they can STRIP IT (which is why in the instructions I point out how to minimize the exposure to hair!). So, after using it, it's very necessary to only use a moisturizing shampoo and to bombard it with oils (I use coconut oil and emu oil). I also use my Laser Messiah right after the shower, but I'll go through that at a later date! 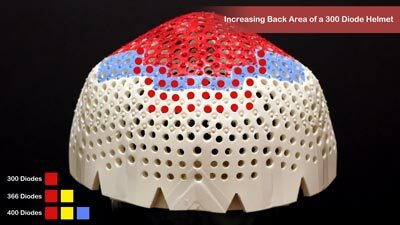 Apply the scalp peel as explained in my "Laser Usage Protocols", minimizing hair exposure. Wet your hair again as explained in the instructions, but bypass the shower cap or plastic wrap and use the scalp heating cap. I use it for 20 minutes, and then I let my hair "air dry" before I start the "buffing" process with the brush. Shampoo with the best DEEP MOISTURIZING SHAMPOO that you've got!!! More detailed explanations (and more "Instruct-Icons" that will show each step!) 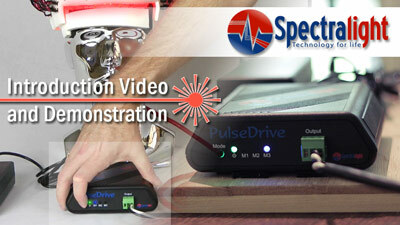 will be in my "Laser Usage Protocols" section of this site! In summary, the idea with scalp peels in general is to remove the calcified / fibrosis layers of skin on the scalp, and this should help laser therapy work much better. PLUS, it should actually help hair regrow all by itself! This is actually "wounding", which, as you probably have heard, does have promising results. There is even talk of STEM CELLS with wounding -and I know that makes people wet their pants. Anyway, you guys can do all the research for wounding -it's out there- and I'll offer my two cents by saying that scalp peels would be probably the IDEAL form of "wounding" because it covers infinitely more area than pin pricks, etc. It's no longer an issue of whether scalp peels help the FACE --pretty much everyone across the board all over the world finds that it helps their skin appear younger, improves collagen, etc. etc. There have been studies done that I'm sure you can find very easily. 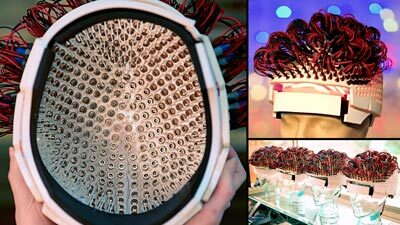 So, we are still innovators with using them for the scalp, but hey.. It's skin! …and Karen had a freaking CLINIC before! SHE HAS SEEN GREAT RESULTS WITH THIS! It's amazing to me how powerful this treatment is and yet forums just do not embrace this info (which is one reason why forums are just terrible --I got an email last week mentioning the [BARF!] "Big Three"! Yeah, they are still stuck on stupid in some of those places, and the hard work of all the people in my generation (like Karen) went right out the window! Scalp Heating Caps and a STRONG 50% Glycolic Acid Peel!